Summary: Starting at 70 deg Northern latitude at the Arctic Ocean in Deadhorse, Prudhoe Bay I cycled down the Dalton Highway, which follows the Alaska oil pipeline. It’s a road with considerable truck traffic – also known as the haul road – which supplies Deadhorse with everything required to subsist up there in the Northern tundra. The road is about 1/3 gravel, 2/3 paved (as of 2009). The biggest challenges for me were the incessant hills, followed by the mosquitoes and the dry, hot, dusty conditions during this first week of July 2009. There are only two service stations over the course of nearly 800km (Coldfoot and Yukon Bridge), so one needs to be somewhat prepared. Other than a badly punctured tube on the front tire I didn’t have any problems. After a much needed rest day in Fairbanks I continued via two very long, but flat days to Tok near the Yukon border. In Tok I spent another rest day, taking advantage of the still working cell phone to call my family and also feasting on some of the best buffet food I had anywhere on this entire trip. After just 9 days of riding and some 1215km after my start I reached the border to Canada. First 90km gravel, at times very difficult and deep, once I pushed my bike in muddy conditions for 2km. Great help by pumpstation 2 guard Jason Shea (who also sends me hi-res photos), the German couple Markus and Jutta, as well as Jim Colleen ( at overlook during dinner). I pitch my tent along the river and prepare for the first night. There are so many mosquitoes; it’s hard to prepare dinner and to eat it without being bitten. I meet two other riders Matt and Batiste who are also doing the Panam Hwy. 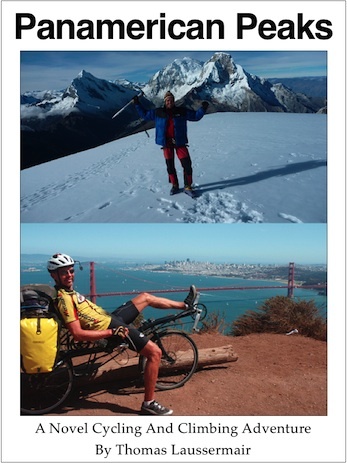 Matt Kelly – who I will stay in touch with throughout the entire trip – has his own website: pedalpanam.com. Happy Valley to Galbraith Lake turnout. Sore throat upon awakening at 7:00am. Breakfast cereal with milk courtesy the folks at Happy Valley! Tough first 30km with gravel and lots of hills; 2 hrs sleep at 40km pumpstation 3 (again very friendly folks similar to Jason Shea who gave me water) and Aspirin. Matt and Batiste ride by and I pack my stuff and catch up to them. Lots of hills; some so steep that we have to push. Batiste’s dérailleur breaks so he can’t continue; however he hitches a truck ride within 1/2 hrs! Very scenic landscape in evening with Brooks Range close by. 6:20am – 19:10pm; my first marathon day. 50km to Atigun Pass (1410m); last 2km too steep for me (pushing was hard work). Beautiful summer day, perfect weather, except early morning very warm. I am completely exhausted by the time I get to camp. Soup and Salad buffet, then setup tent, then hot shower, then meet & chat with Markus and Jutta one more time in sleeping bag by midnight, nice cool air to sleep. Start at 9:10am; chilly downhill, but soon very warm on the many steep hills. 2hrs rest at noon at Finger Mountain after long climb. Very tiring hills, also end of pavement, but gravel comparatively good. Arrive at Hot Spot around 7:45pm and have Mushroom Burger and Milkshake for dinner Met Josh and Rene who bike from Anchorage to Prudhoe Bay and were on day 11 of their tour. Tent on undeveloped campground, but great water from well right next to it. Start at 7:30am, short 8km ride to Yukon River Bridge / Camp for breakfast. Need to pass time (45min) as they only open up at 9:00am! Walk to Yukon river and to Alaska Pipeline display / interpretive center. The km are ticking by, I almost see myself at the end of gravel and finishing the Dalton when 20km before I get a flat front tire at 30km/h downhill! Luckily I can stop without crash, but the front tube got punctured many times after the initial flat! My repair kit doesn’t have enough rubber cement, so I can fix only 5 of the 6 holes waited for 1 hour, then motorcycle driver stopped and gave my supplies, thankfully I could continue! Reached end of Dalton around 8pm. After a few km on the paved road I see a campground sign; turns out this is only a normal parking lot, but at least we’ve got flat ground. Nearby I find water from a creek to wash off the dust and sweat, as well as to filter drinking water. Then I meet & greet with John – 79 yr old widower on fishing trip in camper mobil – he gives me hot water for my freeze dried food and invites me to sit in his camper for dinner, where we chat for about 1 hour. End of Dalton Hwy and Prudhoe Bay to Fairbanks section. See also the Blog post on the Dalton Highway stretch with some nice photos. After some badly needed rain overnight I pack my stuff and get ready to leave the Tanana Valley campground in Fairbanks. I stop at the sports shop to check my tire pressure. It’s almost 11:00am by the time I head East. I stop at a little place called North Pole for brunch. Nice views along the river landscape created by the Tanana river! Arrive in Delta Jct at 9:10p, the diner closed kitchen at 9:00p I go to Alaskan Steakhouse instead, but likewise they have reduced cooking (only burgers). I stay at local state park campground (no-frills). Sleep from 11:00p to 8:20a next day! 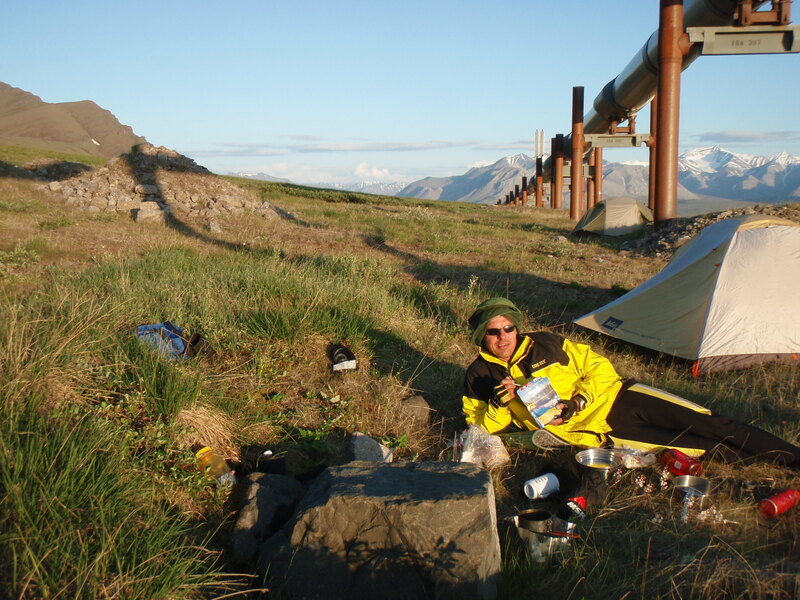 Further towards Tok I meet Tien, who rides from Toronto to Prudhoe Bay. We exchange Snickers and Bananas as well as some stories of the road. Arrive in Tok at 8:20p ahead of schedule, so there is still plenty of time for dinner at Fast Eddies, the most popular place in town. Tok to Canada border and on to Beaver Creek. See also the related Blog post “Goodbye Alaska – Hello Yukon” with some nice photos.